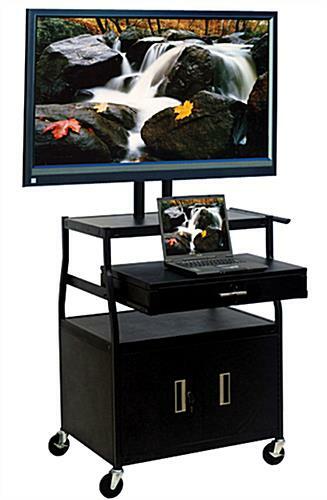 This Multimedia Presentation Cart is Height Adjustable! Find Many Different Sizes and Styles Here! 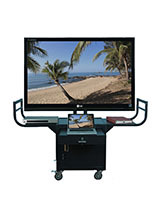 This Multimedia Presentation Cart is Ready to Ship! Holds the majority of flat screens up to 52" weighing less than 110 lbs. Durable steel construction with a black powder coated finish for a sleek and lasting display. (4) 4" caster wheels that swivel with two locking to keep steadily in place while in use. Security drawer locks to keep items secure and can be pulled out from the front or back of the trolley. Large two door security cabinet can hold expensive equipment for a display that is safe for use in busy establishments. 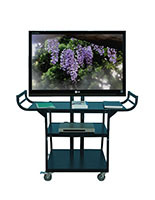 This multimedia presentation cart that has 4 wheels allows for easy mobility around a room or building. The two locking wheels allow for stability when in use. This projector trolley, multimedia presentation cart that has a black powder coated finish provides a clean and sleek appearance. Many classrooms and offices will find that this display fits right in. 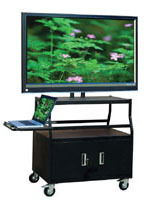 This steel construction multimedia presentation cart is durable and meant for years of use! 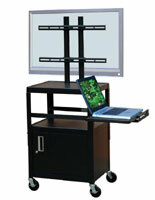 This mobile trolley can hold a flat screen, laptop, dvd player, and any other AV equipment. 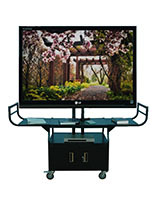 This multimedia presentation cart comes with a UL listed 15' power cord with 4 outlet surge protector and cord winder so purchasers only need to supply the devices. This rolling workstation can be moved from room to room or simply to different areas of a space to keep it out of the way. 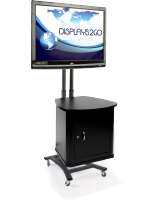 This multimedia presentation cart can hold a large flat screen for bigger rooms to ensure everyone can see what is being displayed. This unit ships unassembled to save on shipping costs. 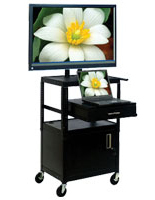 This multimedia presentation cart is durable and efficient. This trolley includes the slide out drawer that can also serve as a laptop shelf or be hidden underneath when not in use. 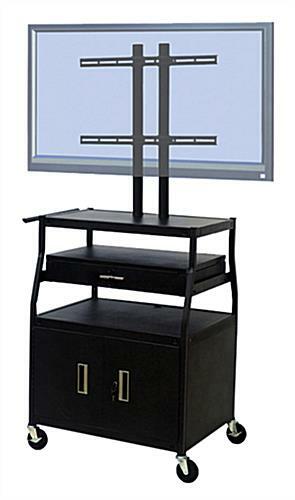 This security storage multimedia presentation cart, also known as a laptop and TV workstation, uses security screws on the flat screen mounting posts. The television screen can be secure and only those with a special tool can un-mount. This multimedia presentation cart that holds up to 52" flat screens has a stable pyramid shaped design. The shelves vary in size and provide ample room for a projector, laptop, and more. This innovative fixture is the new age of classroom trolleys that hold flat screens instead of bulky devices that require a strap to hold in place. Users can wheel this display around knowing expensive equipment will stay in place. Manufacturer model# FDCAB4418E. 25.3" x 44.0" x 22.0"
31.5" x 17.0" x 21.5"
28.8" x 5.0" x 18.2"